For the plant, see Eggplant. Eggplant is a dark purple or brownish-purple color that resembles the color of the outer skin of European eggplants. Another name for the color eggplant is aubergine (the French, German and British English word for eggplant). 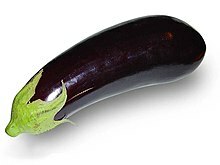 The first recorded use of eggplant as a color name in English was in 1915. The pinkish-purple-grayish color shown in the color box as eggplant was introduced by Crayola in 1998. Different varieties of eggplant may range from indigo to white (the term eggplant originated as a description of white colored eggplants because they look like eggs). Chinese eggplants are the same shape as a European eggplant, but are colored a dark violet color. Thai eggplants are small, round, and colored forest green. ^ David Grambs (1995). The Describer's Dictionary: A Treasury of Terms and Literary Quotations. W. W. Norton & Company. ISBN 0-393-31265-8. ^ a b William Yewdale Adams (1986). Ceramic Industries of Medieval Nubia. University Press of Kentucky. ISBN 0-8131-0500-5. ^ Crayola. "Crayola Creativity Central". Retrieved 31 May 2010. This page was last edited on 30 December 2018, at 17:59 (UTC).